Hello! I am Darick, and I am glad you found my geocaching website. Here you will find free printable log sheets, stash notes, geocaching labels and more. 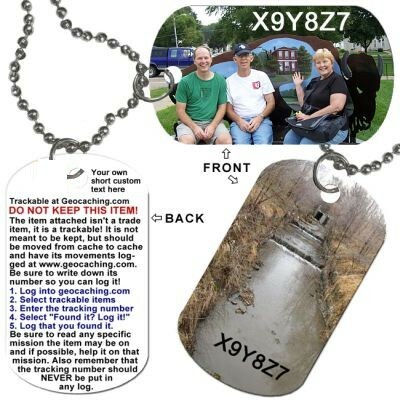 View my custom trackables page to see how you can get your very own unique one of a kind geocaching trackable! I also have geocaching supplies for you, as well as other great geocaching content in my videos, blogs and newsletter pages. Thanks for visiting! Did I mention that I am a geocaching vlogger? What is that, you ask? I take videos of my geocaching adventures and share them with the geocaching community on YouTube. If you love geocaching as much as I do, the next best thing to being out on the trail is following someone else on their geocache outing. Come along with me! Do you have a geocaching "problem"? Take the quiz and find out! Nice printable log sheets, stash notes, cache labels and even a passport for your trackable item. FREE documents to download, print and enjoy... courtesy of Darick. Not familiar with the sport of geocaching? You can join the fun in this real-world outdoor treasure hunting game! Players try to locate hidden containers, called geocaches, using GPS-enabled devices and then share their experiences online. Visit geocaching.com to learn more. Subscribe to my YouTube channel to keep up to date on all of my geocaching adventures!